Here is my wish list of pretty Home Decoration 2014, products for the home and garden for the summer. 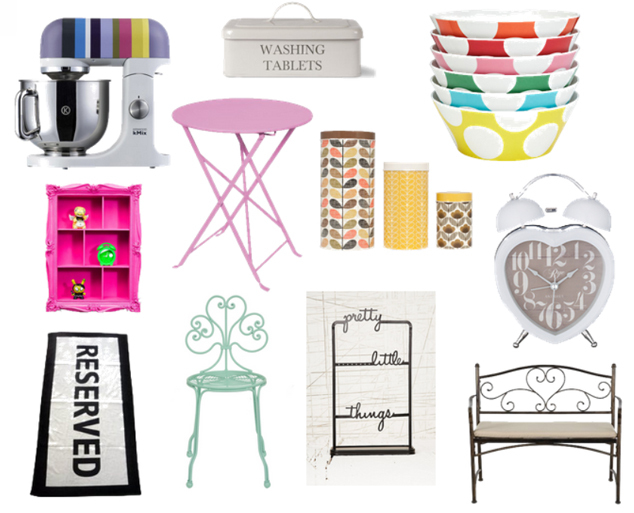 I did a similar homeware wish list post a while ago for a new home which can be found here. I enjoy finding bits and pieces to brighten up the home and add a bit of character with unique products that no one else has. I love the Pretty Little Things Jewellery Stand from Urban Outfitters, I love the fonts use to hang your jewellery from but that it also has hooks for your earrings as I have nowhere to store my earrings at the moment. Urban Outfitters have some amazing, quirky products for around the home such as the Baroque Wall Shelf in Pink. I’m not much of a pink person but this garish, funky wall shelf really caught my eye. Having sun this week in the UK has been fantastic so I have also looked out for some items for in the garden in this home decoration 2014 wish list. I spotted the Primrose Garden Table, Sorrento 2-Seater Steel Bench and Primrose Garden Chair. I love the pastel tones on both the Table and Chair, they would look really modern and fresh in the garden. I hope you enjoy my wish list and please remember to share & like the post, if you want to read more similar posts you can find my other wish lists here. What are your favourite Home Decoration 2014 Wish List items?